Vacation rental house. Sleeps 6, 3 bedrooms, 2.25 bathrooms. No pets allowed. 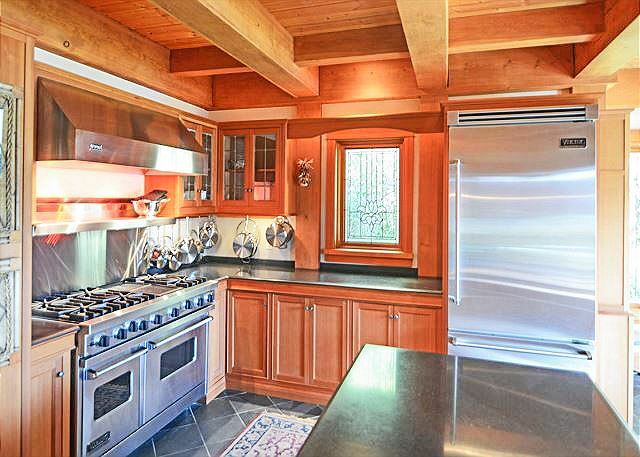 The kitchen is a cook's dream set up with over sized stove tops, ovens and fridge. The lower floor has a large screen TV to enjoy a movie. The water's edge in front of the home at low tide. Welcome to this beautiful Garrison Bay Waterfron Chalet! You can be one of the first guests to stay in this exceptional property. 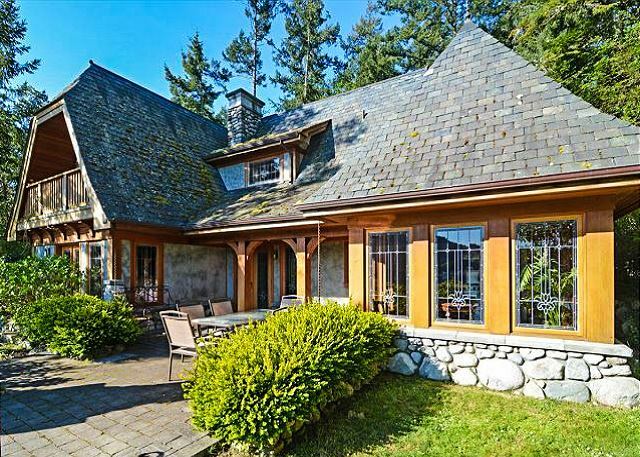 When you arrive at Garrison Bay Chalet, you’ll understand why the exquisite detailing and fine craftsmanship of this special home was featured in design magazines. Its atmospheric European styling, steep slate covered roofline, strong woodwork, cobbled pathways, rugged stacks of stone, and cut glass window panels will make you feel as if you’ve entered a magical world. This unique home snuggles into the shoreline of placid Garrison Bay, directly across from the historic encampments of English Camp National Park. From this location, you’ll enjoy a wonderful view of the park, Young Hill, anchored boats, and those so inclined are also able to launch a kayak from the property in order to explore the bay, hike about the park, and paddle to nearby Roche Harbor Resort. The interior rooms are cozy and warm. Rising two stories within the living room is a massive fireplace assembled from local boulders (you’ll also find a smaller version of this dramatic element in the master bedroom.) The kitchen offers exceptional beauty and functionality, featuring a large work island, sub-zero fridge, 6 burner commercial styled gas range, and excellent housewares. 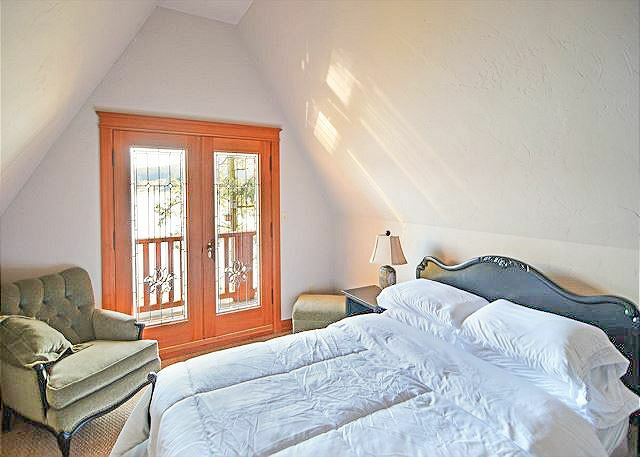 Also on the main level is the master bedroom that offers a queen bed and en-suite bath with tub and separate shower. 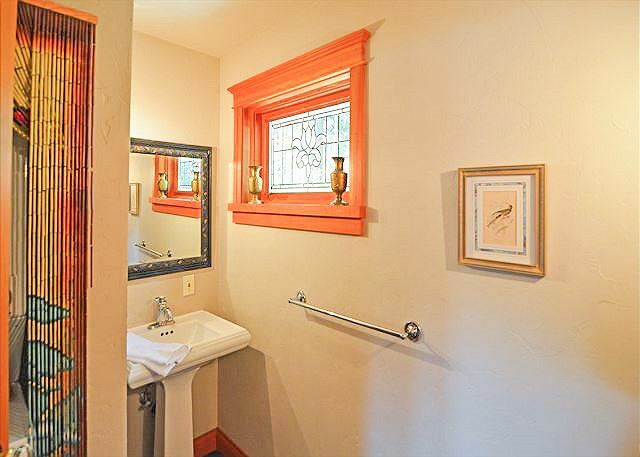 The powder room and a den with large screen TV are also on the lower level. Two more romantic bedrooms, each with a double bed, are on the second story, as is a second bath with tub only. Garrison Bay Chalet is the perfect choice for a small family gathering or a romantic splurge for a couple. Homes of this quality are rarely available for rental so you’ll need to book early! Such a wonderful and perfect place to stay! We loved staying in this cute little chateau! It was so charming and we loved being right on the water! It was so quiet! The home could use some curtains in the bedrooms as we aren’t used to the sun rising so early! And the flooring upstairs was hard on your bare feet. The mattresses and pillows in the upstairs bedrooms could also use some updating but otherwise we enjoyed our stay. The house is adorable and otherwise comfortable. Thanks for a great stay! Overall great experience. Would like to see minimum of queen size beds in all bedrooms - other than that all was as advertised. This home is immaculate and impressive. The drive right up to it is amazing!!! We saw deer, winded through the forest, views and drive could not be more perfect! 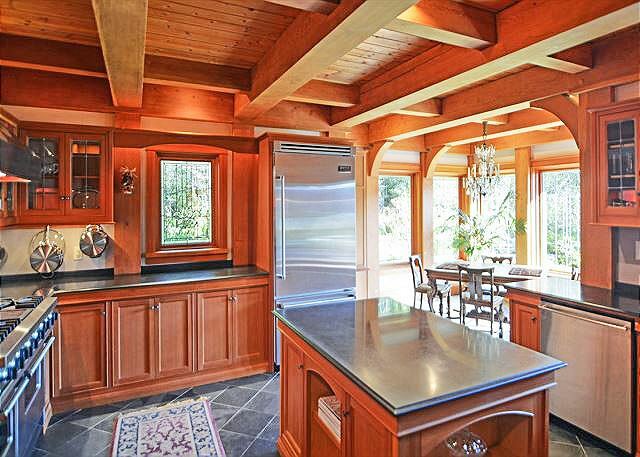 6 burner Viking...huge heavy beamed high ceilings throughout, truly incredible! Playhouse and green house and leaded glass throughout are absolutely delightful! Alas, not without its doors have screens and no windows although it stayed plenty cool outside, it got too warm at night. Also, no electric plugs in bathroom, and absolutely no comfortable chairs. Kitchen chairs are small antique cane bottom chair with sagging cane... no where to sit that was remotely comfortable inside or out sadly. Please get comfy chairs! Other than that... omgosh friendliest town, great food, perfect hikes and walks, seemed like there's always a festival so fun! Deer get through the fenced yard daily and snack on flowers and greenery, which must be frustrating for owners but of course we loved to watch them! This kitchen is stocked with every single thing u could want! We would love to stay again n with a few seating improvements.